Burn Bright is a young adult novel by Marianne de Pierres. The story centers on a young girl named Retra who runs away from home to find her brother on the mysterious island of endless pleasures and endless night, Ixion. The book is a mixture of the paranormal and science fiction. Retra always led a very sheltered life in a place called Grave. It is an island that frowns upon touching, expressing emotion, and any sort of pleasure. Retra is a Seal, which is one of the most extremely limited members of that society and focuses meditation, solitude, and isolation. After her brother Joel ran away the previous year, her family lost all privacy in their home. Additionally, Retra had an obedience strip implanted into her upper thigh that caused intense pain if she strayed too far from her set limits within the Seal compound to deter her from ever attempting the same. She worked against the pain and the knowledge of what her actions will do to her parents, sneaking aboard a mysterious ship that comes to Grave to pick up unsatisfied teenagers once a year. The journey alone is fraught with peril, but nothing compared to the danger she will face on Ixion if she cannot let go of her modesty and "burn bright". Burn Bright was one of the most unique books I have ever read. The world is (as the best I can figure since I was confused by it most of the time) made up of various islands, which teenagers escape from to go through a vortex that takes them to an island that exists in a plane where night never ends. The guardians of the runaways are Ripers - human-seeming individuals who both rule and place themselves above their charges led by Lenoir. They keep order on Ixion and try to keep the children on the pathways and out of the grasps of the island's Night Creatures. The runaways themselves are perplexing, as they all have their own motives for being there - some of which are surprising. I don't want to say too much about what goes on in the book because part of the reason I enjoyed it so much is that I was really clueless throughout most of it. 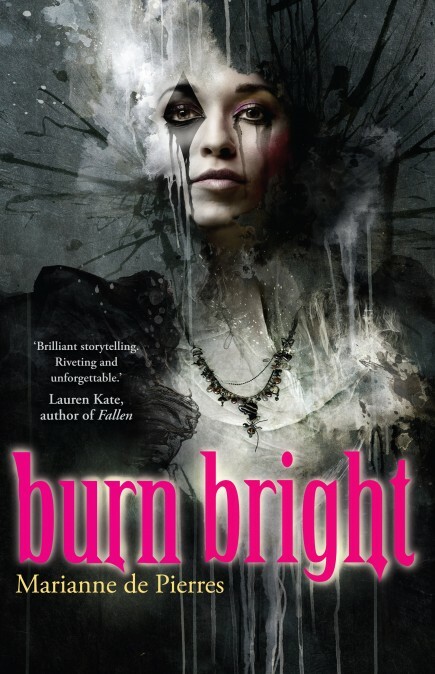 Being as Burn Bright was such a dark, violent book with instances of drug use and sexual situations, I would recommend this book for adults and older teens. Even if someone is hesitant about reading something of this nature, it is not one to miss. If you are American and lucky enough to get your hands on a copy, I would suggest that you jump on the opportunity. You should also make arrangements to get Angel Arias. That's what I'm currently doing. I am not including any "buy this book immediately" links because I have none as a downtrodden US citizen. I was lucky enough to receive this book for the Burn Bright Book Tour hosted by the lovely Dani at Refracted Light Young Adult Book Reviews. Fantastic review! I was kinda surprised that I enjoyed this book as much as I did, with just how dark and gritty it was and the amoral atmosphere... but it just sucked me right in! I bought Angel Arias within five minutes of getting this comment. It was just as cheap as a US paperback. *sigh* I'm such a pushover. Hmmm, I'm not sure about whether I'll like this. Decisions.